Absheron Peninsula with its beautiful landscapes, mud volcanoes, oil rigs and sunny beaches is the heart of Azerbaijan. Absheron is the very place from where the world oil industry took the roots. In 1846 - more than a decade before the Americans made their famous discovery of oil in Pennsylvania - Azerbaijan drilled its first oil well in Bibiheybat, Absheron. The Peninsula is also famous for its tasty mulberries, delicious figs and aromatic saffron. The Caspian shores, sunny days, waves breaking against rocks, fig trees, country houses - all these are reflected in the works of Azerbaijani artists dedicated to the Absheron peninsula. The exhibition featuring local artists’ works inspired by Absheron is on display at the Art Tower. The works were created during workshops held on September 2-24, Trend Life reported. Art lovers can enjoy vivid paintings created by local artists on weekends. 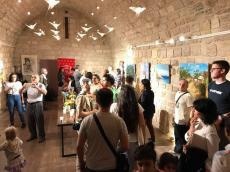 The event was organized by the Azerbaijan Ministry of Culture and Tourism, the Administration of the State Historical and Architectural Reserve "Icherisheher" and the NGO Arts Council Azerbaijan.